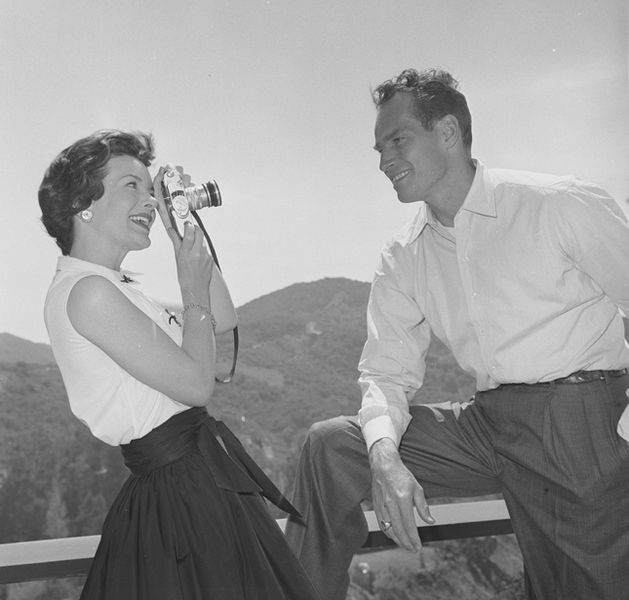 Charlton Heston with wife Lydia at home. He fought for mankind in Planet of the Apes, he battled zombie, vampire like beings as the last man on earth in The Omega Man, he saved a 747 from disaster in Airport 1975, he saved many of LA's citizens in Earthquake, and in 1994 Charlton Heston saved some Wisconsin ticket holders from missing the Rose Bowl football game. "Many counterfeit tickets had been sold before the game. The sudden infusion of Wisconsinites into Los Angeles caused two things - one, a city wide beer shortage and two, a hot market for illegal ticket sales. Outraged by the news that ticket sharks were preying on helpless visitors, Charlton Heston graciously opened his home to anyone caught without a seat. There, they could watch the game on Heston's wide screen state-of-the-art home theater." 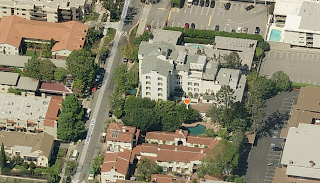 If I flew cross country to watch the Rose Bowl game only to learn that my tickets were fake, I think watching the game with God (Heston did the voice of God in the film the Ten Commandments) at his modern designed home high atop Beverly Hills, would be a pretty nice alternative. Heston's wife of fifty years was from Two Rivers, Wisconsin. To read more about other Hollywood, political, musical, and pop-culture significant figures connected with Wisconsin I recommend reading the entertaining blog Wisconsinology. The #9 Wisconsin Badgers are once again back at the Rose Bowl, this time as the underdog taking on the #6 Oregon Ducks. 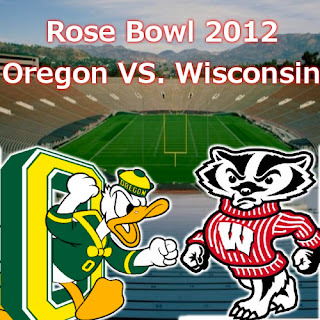 The game will be on January 2, 2012 at the Rose Bowl stadium in Pasadena, California. Suppose They Gave a War and Nobody Came? (1970) is one of those movies I just had to see because of the all-star cast but when I finally did see the film I knew why, despite all the names in the film, nobody ever talks about it. 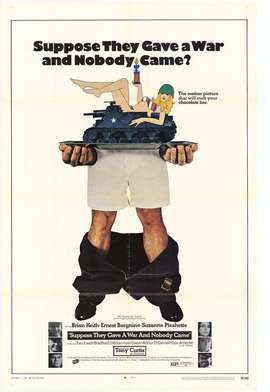 Brian Keith, Tony Curtis, Ernest Borgnine, Suzanne Pleshette, Tom Ewell, and Don Ameche headline this parody of the U.S. military, but nothing any one of these stars does can save this film from feeling long and boring. Made at the height of the Vietnam war, you get the feeling that this movie was supposed to be one of those "message" films but really, the whole movie seems so ridiculous that any intended message gets buried in the clownish story. The story is set in a small Southern town that is home to an Army base. The town locals dislike the presence of the military in their community and tension builds between the locals and the military. Col. Flanders (Ameche) hires Officer Nace (Keith) to help improve community relations, but Ernest Borgnine, a sheriff with a chip on his shoulder isn't ready to work with the military on improving relations. Tony Curtis, a loud-mouth, scheming, trouble making Sergeant only makes matters worse and eventually ends up in jail. When his friend Nace comes to break him out using a borrowed tank, the zealous Tom Ewell leads a milita to go to war against the Army. As much as I disliked the film, I did enjoy noticing that the small town where most of the action takes place, including the final confrontation between the locals and the military, was filmed on the Warner Bros. backlot in Burbank, specifically on Midwest Street. This area of the lot has most recently appeared in the television show Hart of Dixie filling in for another Southern community and also on the big screen in The Muppets. In The Muppets, Midwest Street is "Smalltown," the town where Jason Segel and Amy Adams live. 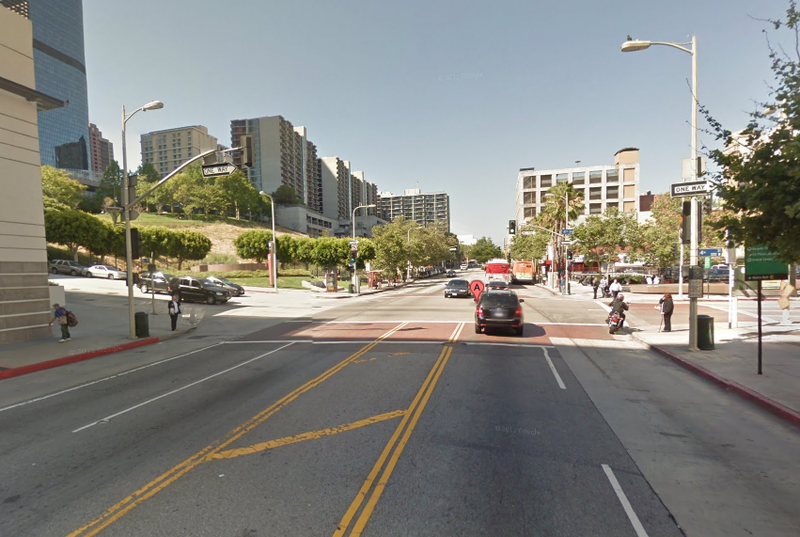 Below are comparisons of Midwest Street as it appeared in Suppose They Gave a War and Nobody Came? (1970) and how Midwest Street appears today. Ernest Borgnine & Suzanne Pleshette in a drug store set. Looking out from the drug store entrance. Pleshette leaves the drug store. Another view looking from the drug store. Borgnine near the center of Warner Bros. Midwest Street. chapel stands in the background. Borgnine walking towards the middle of Midwest Street. Looking at the center of Midwest Street as it presently appears. Borgnine stands in front of the drug store. The drug store facade as it appears today. Borgnine, Tony Curtis, Brian Keith on Midwest Street. Curtis drives a bus into Midwest Street to pick up new recruits. The building on the left is the "Star" theatre building. Borgnine looks at the military in disgust. 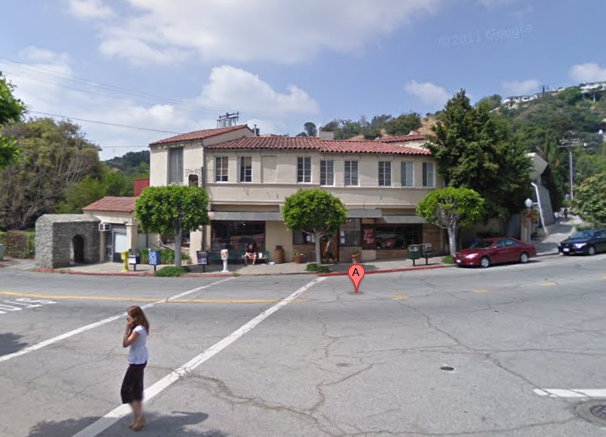 The facades behind Borgnine as they appear today. The drug store is seen top center. The same facades today, stripped down. This next view is pretty cool because the western style facades no longer exist. You can see in the contemporary photo the green hills in the background but the western facades have been demolished and replaced. The western style facades above no longer exist. All that is the same are the green hills in the distant background. Bradford Dillman stands on a jeep parked on Midwest Street. The facade of the Star theatre as it appears today. Borgnine in front of the police station. The police station facade as it appears today. The next view is another showing more of the western style facades (on the right side) that no longer exist. On the left you will notice the backside of the white chapel building is still there. The army and the town police go at it on Midwest Street. Entering Midwest Street from the back. The backside of the white chapel. The backdoor to the chapel building has been stripped away. of the chapel would be a little further to the left. The same view in front of the chapel is it appears today. Looking down from the police station. view has changed quite a bit. Over ten years prior to Tony Curtis arriving on Midwest Street in a bus to pick up military recruits another film, a very funny military themed comedy from the 1950s, used the same location on the Warner Bros. backlot as the spot to pick up new recruits. Any guesses as to what movie this may be? Come back next week and I'll have a post on the now and then comparisons from this 1950s film. To see the answer of which 1950s film used Midwest Street as the location to pick up military recruits click here. Earlier this month The Criterion Collection released a high definition digital restoration of the pre-code classic film, Design For Living (1933) on DVD and Blu-Ray, but if you want a chance to enjoy this film on the big screen as it was meant to be, prior to enjoying the film at home, the American Cinematheque will be presenting a screening of the film at the Aero theatre in Santa Monica, California. The screening is scheduled for Wednesday, December 28, 2011 and is the second part of a double feature, the first film being another Ernst Lubitsch classic, Ninotchka (1939). Lubitsch's daughter Nicola, will be introducing the double feature. And for those who haven't purchased a copy of Design For Living, all ticket holders will have a chance to win a DVD of the Criterion release. 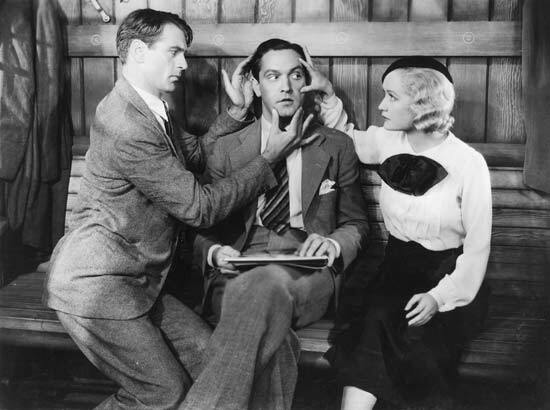 Design For Living stars the always handsome Gary Cooper, the actor's actor Fredric March, and scene stealer Miriam Hopkins. Cooper and March play roommates living in Paris who both fall in love with the same girl, Gilda Farrell, played by Hopkins. Hopkins can't decide which man she loves, so what does she do? She decides to live with both men! "Garbo Laughs!" was the tagline for the romantic comedy, Ninotchka, starring Greta Garbo and Melvyn Douglas. In this film, Garbo is a tough Russian woman sent to Paris to sell some stolen jewelery and bring back three fellow Russians who couldn't complete the task because they had become distracted by the luxuries of a capitalist society. Garbo too begins to fall in love with the West and also with a charming Count (Douglas). What is a Russian girl to do? 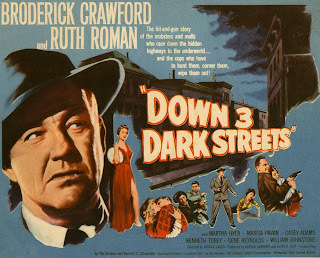 Down Three Dark Streets (1954) stars Broderick Crawford as John Ripley, an FBI agent who takes on three unrelated cases in hopes that one will lead to the killer of his fellow agent. As with so many 1950s crime films, this one was done in a documentary style, with a heavy use of voice-over. I feel this technique makes the film less thrilling but overall the film still works as an entertaining mystery. What's most attractive about this film is its use of location photography, including scenes at Los Angeles's Subway Terminal (yes, LA had a subway in the 1950s), downtown Los Angeles, and the Hollywood Sign. 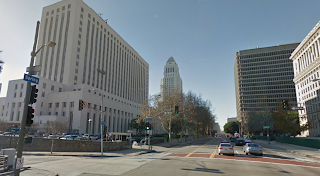 The establishing shot for the Los Angeles branch of the FBI, as seen in the screenshot below, includes LA's iconic City Hall building on the right and the District Court building on the left. 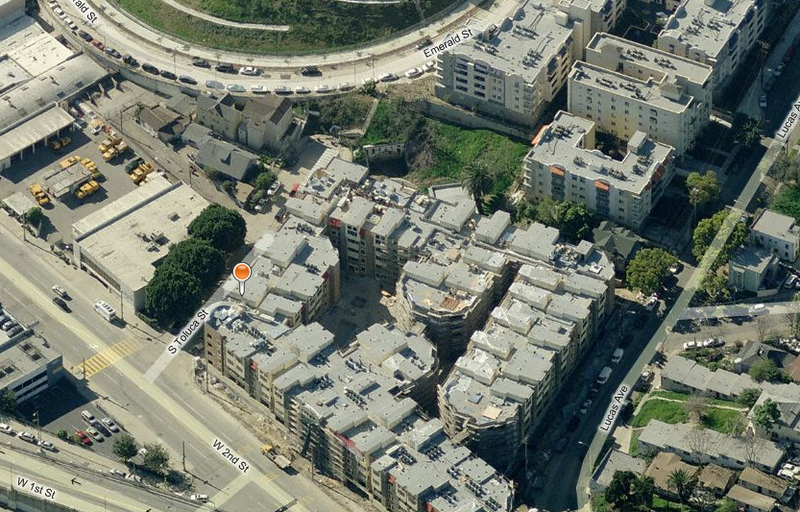 As you can see in the comparison photo, this location hasn't changed much. That isn't the case with some of the other locations. District Court building on left. City Hall on right. The District Court and City Hall buildings as they appear today. Before FBI agent Zack Stewart (Kenneth Tobey) is shot and killed and Crawford takes over his cases, Stewart pays a visit to Ohrbach's department store on Wilshire Boulevard where he intends to meet a woman named Kate Martel (Ruth Roman), a victim of an extortionist. Ohrbach's was located where the Museum Square area is today. Below is a screenshot of Stewart walking up to Ohrbach's, a vintage postcard looking down Wilshire Boulevard with a view of the art deco Desmond's building in the background, and a Google Street View showing the same view as it appears today. 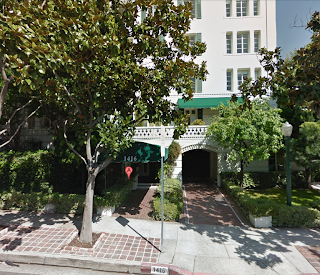 If you look closely you can still see the Desmond's department store tower in the background of the Google Street View. Stewart visits Ohrbach's department store. Ohrbach's department store on Wilshire Boulevard, LA. What is left of Ohrbach's department store on left. In another scene, Crawford visits Connie Anderson (Martha Hyer), the girlfriend of one of the men Stewart was investigating at her apartment in West Hollywood. Hyer's apartment building is the Colonial House located at 1416 Havenhurst Drive. This building, built in 1930, recently had a three bedroom condo for sale listed for $2,150,000 so it doesn't come cheap. Below is a screenshot of the entrance of the Colonial House, a contemporary view of the entrance and a Bing Bird's Eye view of the building. Crawford and partner approach the Colonial House. The screenshot below is a view looking down North Broadway towards West Temple Street. The Law Building can be seen on the right. On the far left you can see the corner of the Los Angeles Hall of Justice building. 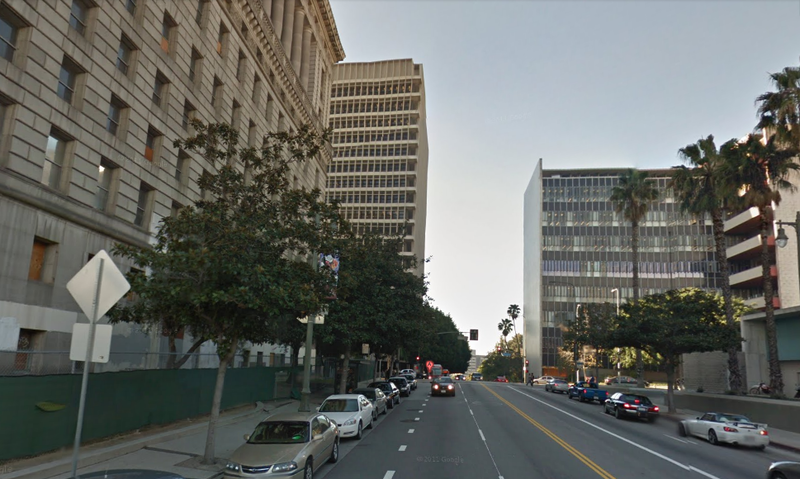 In the contemporary image you will see that The Law building and the building directly across the street are both demolished. The old Los Angeles Hall of Justice Building, although closed, is still standing. Looking down Broadway towards Temple. Hall of Justice far left. Law Building on right. Hall of Justice on left. Law building on right now replaced. 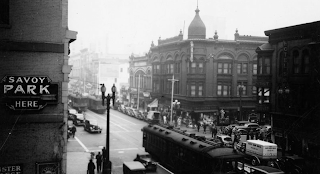 In another downtown Los Angeles scene FBI agents follow Hyer on her way to the subway. In the screenshot below we get a glimpse of Hill Street at Fourth Street. 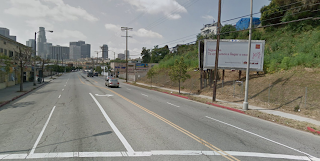 For comparison I've included a historic image of the intersection from the Los Angeles Library Photo Collection which shows the domed Brighton Hotel on the northeast corner and the Hotel Sherman on the southeast corner. Below that is a contemporary view of the intersection. You can see nothing is really left. The whole intersection is completely different. Looking down Hill Street towards Fourth Street. Hill Street at Fourth Street. Looking down Hill Street at Fourth Street as it appears today. When Hyer boards the subway at the downtown Los Angeles Subway Terminal Building, she sneaks onto a train headed for Glendale. That train comes above ground at the Toluca Portal near 279 S. Toluca Street. The portal has now been sealed up and the train line has been completely blocked by the construction of a new building. Below is a screenshot from the film showing the train exiting the tunnel, a contemporary look of the tunnel as it appears today looking from Toluca Street, and a Bing Bird's Eye View showing the building that now stands directly in front of the tunnel. Hyer rides the train through the Toluca Portal. Looking at what is left of the Toluca Portal. The portal (top center) blocked by a large building. 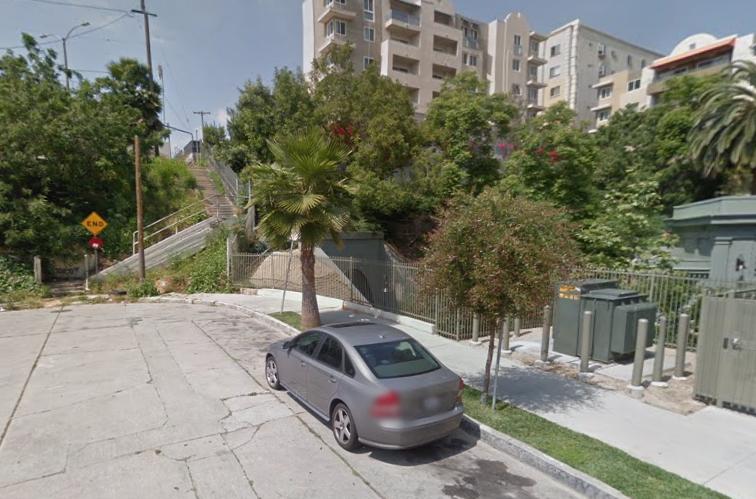 Once the train goes above ground it follows the path of Glendale Boulevard. 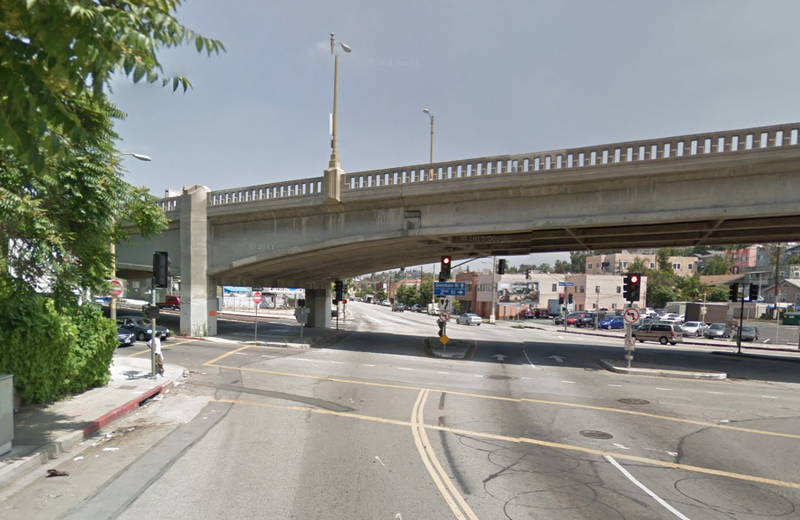 In the screenshot below the train goes under the Beverly bridge near the intersection of Glendale Boulevard and 2nd Street. 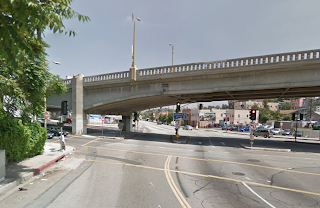 The Beverly Bridge as it appears today. 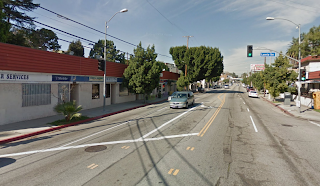 In the next scene the train continues down Glendale Boulevard. 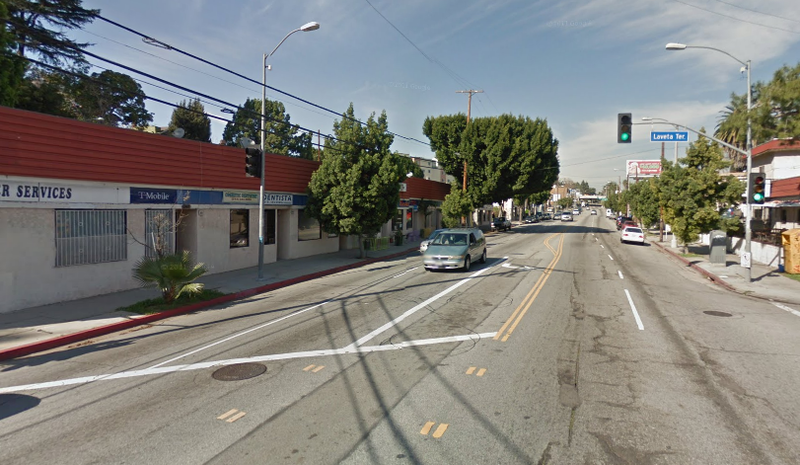 In the screenshot below the train approaches the intersection of Glendale Blvd and Court Street. 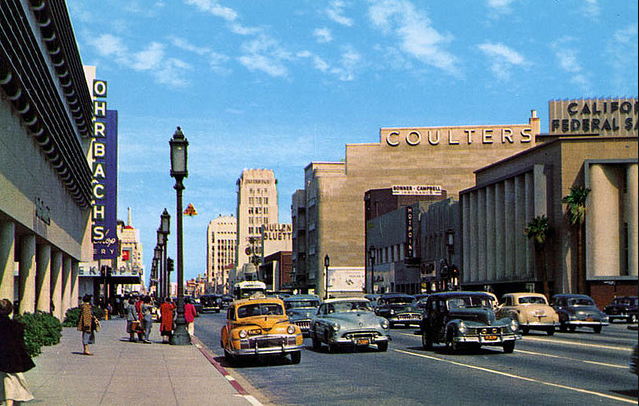 What's amazing to see is how the skyline has changed so much since 1954. In the background of the screenshot you cannot see even one high-rise building. In the contemporary image you can see all the modern office tower buildings in the background. 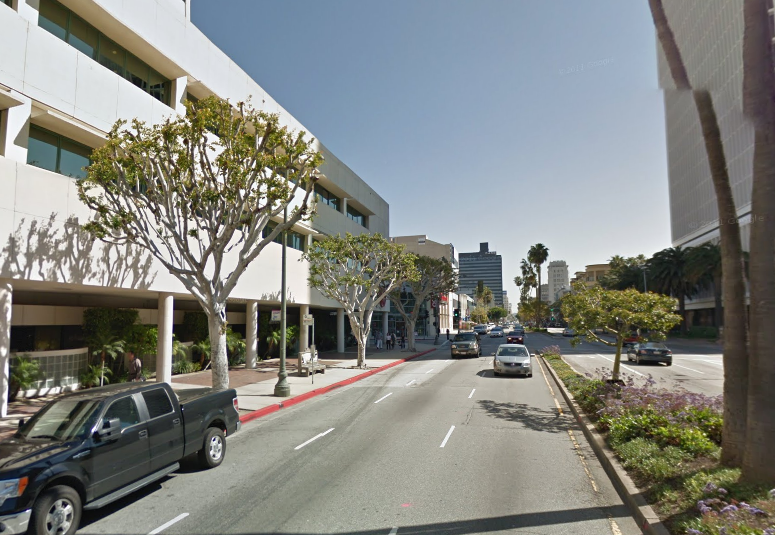 Looking down Glendale Blvd at Court Street as it appears today. In the next scene the camera changes directions and looks down the other direction of Glendale Boulevard, still near Court Street, towards the 101 freeway in the distance. Looking down Glendale Blvd from Court Street. Looking down Glendale Blvd from Court St towards the 101 freeway. The finale of the film all takes place in the Hollywood Hills near the famous Hollywood sign. Crawford is hot on the trail of the killer of his fellow agent who also happens to be the extortionist. The screenshot below shows the intersection of Westshire Drive near Beachwood Drive just a short distance below the Hollywood sign. 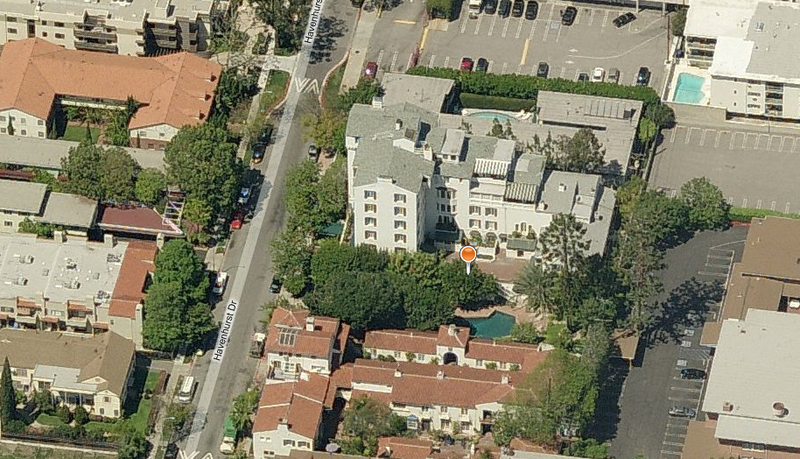 Westshire Drive at Beachwood Drive as seen in the film. Westshire Drive at Beachwood Drive as it appears today. Crawford learns that the killer as at the Hollywood sign. Down Three Dark Streets is an alright film that is worth watching if for nothing else, the time capsule look at Los Angeles in the 1950s. My favorite scenes are those showing the old Subway Terminal Building and the shots of the train passing through the Toluca Portal. Down Three Dark Streets is available on DVD and is also currently available as a Netflix Watch Instantly title. All Street View images (c) 2011 Google Street View, Pictometry Bird's Eye (c) 2010 Pictometry International Corp.